Favorite race distance: Marathon. There is something that intrigues me about trying to cover 26.2 miles as quickly and efficiently as I can. Best racing distance: 10k-Half Marathon. That is my bread and butter distance. My best races have been within this range. Grandma’s Marathon (2015). This race came just 3 months after getting married, and one month after moving to the St. Louis area. I remember the downpour of rain that came within minutes of the start. This race was where the stars aligned. I started behind the elite field, but by about 3-4 miles in, there were groups forming in which to work with. I split the first half and 2nd half within 5 seconds of one another, (1:17:22/1:17:27) to run a personal best in the marathon. I got started in the sport as an incoming freshman in high school. My grandma actually paid me 50cents a mile in the summer prior to cross country instead of playing football. That only lasted one summer, ha! I ended up taking 2nd place in my first race (Freshman race, West Bend), and the rest was history. I took an interest in the sport due to the fact that I could outwork a lot of kids with more natural talent than I had. One of my favorite moments was being apart of a State Championship Cross Country team my first year. It lit a fire in me, and has led to a lifelong love of the sport. I reached out to Matt Lawder when we moved to St. Louis. I was able to meet both him and Matt Kruger at a few runs. Big River Running Company, and the staff that works at each of the locations have always made me feel welcome. Whether it was the store in O’Fallon, or U City or South City. The staff is willing to help you with anything running related. Having a team in which to meet up with is really awesome. After living in other cities for extended periods of time, I can say that this is very unique. Matt Helbig has provided unwavering support for us, whether you’re an Olympic Trials caliber athlete, or one of the better local runners in the area. The teammates are great. It has been really inspiring to see our women’s team have the great success that they have had so far this spring. I really look forward to more runs and interaction with this group. I would encourage anyone to get involved with this great group and company. 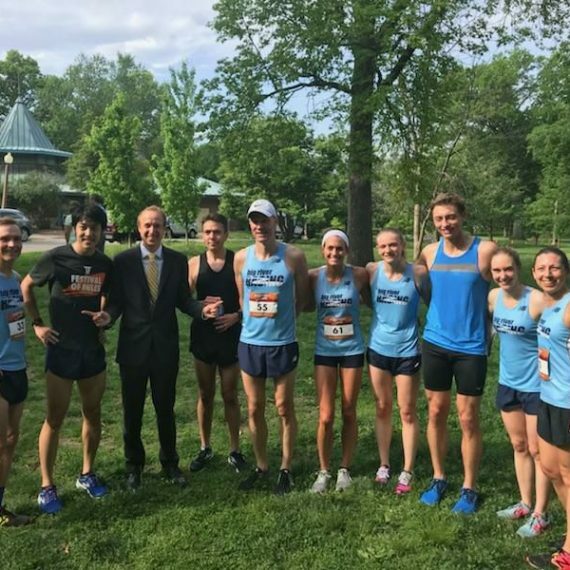 Because of this great connection, I feel more connected to the St. Louis running community. If I am not racing an event, I always try to volunteer to help with events when I can. It is important to give back to the people who provide these wonderful opportunities. I have had 4 coaches in my lifetime, and I would like to think that each has shaped me into the runner I am currently. I am currently training for the Kentucky Derby Half Marathon (Louisville, KY). My goal this spring has been to try and break 1:11:00. The spring so far has been very positive for me. As my wife and I are preparing to have our first child, I have had to make sure to set realistic goals, and keep a healthy balance between work stress, husbandly (and soon to be fatherly) responsibilities (Just moved from St. Charles to Glen Carbon), and training. I tend to average about 75-80 miles per week for 5k-half marathon training, and 80-85 when training for a marathon. I subscribe to the philosophy of keeping the hard days “hard” and easy days “easy”. This has kept me in good health, and logging consistent mileage for the past 3-4 years. Prior to 2013, I would tend to push my easy runs at a quicker pace, but still expect myself to hit workouts. This was not sustainable. This resulted in developing plantar fasciitis, and two heel spurs. When I made the switch back to my current coach, Jeremy Donahue, I made a commitment to train more sensibly. This meant swallowing my pride, and not grinding out a 10-12 mile training run in 6:30 pace or faster between workout days, but rather trusting that the workload within the workout days was enough to build fitness. This can be a tough adjustment for any runner or athlete. Once I bought into this, that was when PR’s began happening. I was able to hit my workouts, and recover in between. I started my racing season in January/February with 2 5k’s in prep for the St. Pat’s Run. I would consider that run a success. It was not a personal best by any means, but I was very pleased, as the field of runners was extremely strong. Also, I believe hitting a lot of singles and doubles within a racing season is a good sign for future races and training blocks. Not every training block can result in a personal best. I’ve been healthy and feel strong as my goal race approaches. I feel that my goal is very attainable, and it is because I have committed to a training model that works for me. This type of training, along with some strength work in the gym have really helped me stay strong and injury-free. It depends on the goal race. I’m a big believer in trying to get efficient in the pace in which you’re training for. while touching on paces that a slightly faster and slower than that pace. If someone in the area is reading this, talk to Jason Holroyd or Mark Spewak. They are training gurus who are both some of the best coaches in the area. Primary: Marathon Pace. 5:48-5:55 pace, and make progress throughout the buildup. I may start with 2x3miles @MP at the beginning of my non-specific period, and progress to being able to complete 3x3miles @MP w/2-3min recoveries, or 2x5miles @MP. Long runs are also used. Ex. 5miles @ moderate pace, 5miles@MP, 5miles @ moderate pace, 5miles@MP. I have to remember that the marathon is all about extension. My goal is to extend my fitness level and efficiency to where I can run 26.2 miles. I’m a certified Exercise Physiologist through ACSM, so I have found an interest in researching great corrective strengthening exercises for myself, along with other runners.